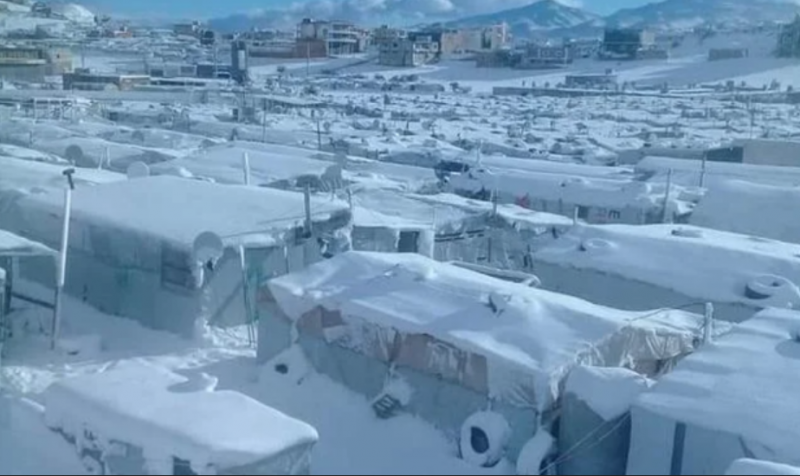 Arsal Camp in Lebanon battered by snow during “Norma” storm, January 6, 2019. Widely shared photo on social media, re-used with permission. Syrian refugees in Lebanon face floods and freezing temperatures amidst a series of storms called “Norma” that hit on January 6, 2019. It brought five days of high levels of rain on the Lebanese coast and snow on Mount Lebanon and the Bekaa Valley. The storm caused widespread damage in Lebanon, flooding highways and closing schools for two days in some regions of the country. Syrian refugees had to battle the storm in makeshift informal camps, as Lebanese authorities do not allow for permanent structures to be built. According to a U.N. Refugee Agency (UNHCR) report published on January 9, “70,000 refugees living in around 850 informal settlements could be at risk of either flooding, heavy snow or extreme cold”. Another UNHCR article stated that more than 11,300 refugees have been affected: settlements in Dalhamiya in the Bekaa Valley have been completely flooded. According to the Associated Press, the refugee settlement in Bar Elias in the Bekaa Valley, near Lebanon’s longest river, the Litani, was flooded during the storm. It is home to approximately 420 refugees, including 100 children. The AP also reported that a Syrian girl lost her life after she drowned in an overflowing river north of Lebanon. Additionally, the Lebanese Red Cross said that 200 people were forced to evacuate from their camp on Lebanon’s northern border with Syria after a local river overflowed. Some Syrians activists and Twitter users lamented the poor living conditions, adding that Syrian refugees are increasingly stuck between a rock and a hard place. In other words, between poor living conditions in Lebanon, and serious security risks in an Assad-controlled Syria if they return. Some Syrian refugees denounce the negligence of local authority in the Bekaa. For example, Hussam Mansour told Al Jazeera that he has called the local municipality of Ghazze in the Bekaa many times to raise the ground levels of the tents, to no avail. Syrian refugees in Lebanon will have to face a new storm that will bring wind gusts of over 100 Km/h and 5 meters waves. The storm, named Miriam, will peak on Tuesday January 15. UNCHR stated that emergency stocks and sanitation supplies were replenished in anticipation of the new storms. Despite the difficulties endured by Syrian refugees throughout the country, Lebanese President Joseph Aoun said that “the refugee crisis still weighs [on Lebanon] economically and socially and on security” and that refugees should return to Syria so that they could live “with dignity”. This is in line with the anti-refugee rhetoric taken by his party, the Free Patriotic Movement (FPM) over the years, and notably by his son-in-law and foreign minister, Gebran Bassil, who also heads the FPM. Aoun, an ally of the pro-Assad militant group Hezbollah, is pushing the international community to return Syrian refugees back to so-called ‘safe areas’ in Syria. Some ministers in the Lebanese government denounced the push and claim that dozens of refugees who returned were killed. Stories of returned refugees facing imprisonment, forced conscription or death have been floating around anti-Assad Syrian circles, particularly in the past couple of years. Wessal al Mustafa, a refugee in Lebanon told Aljazeera that “there is nothing to return to”.